Years ago I worked in a very busy bakery. I primarily iced cakes for the decorators and set up the wedding cakes. This was back before rolled fondant was such a huge thing, and nearly all brides were still ordering buttercream wedding cakes. I knew how to work with rolled fondant, as did the assistant manager, so it was something the bakery offered, but we just didn't get that many orders for it. One lady was having a small wedding and wanted a two-tier cake decorated to look like gift packages. I know, you see these all over the place now, and they've become a bit cliche, but back then it was still a relatively new thing. All I had to go on was the size of the cake, and that she wanted the colors to be white, silver, and periwinkle. She may have actually requested lilac. I honestly can't remember now, but it was one of those nonspecific purplish colors, anyway. The thing is, she didn't bring in any kind of fabric swatch or sample of the color, so I had nothing to try and match. Often one of the hardest things about decorating cakes is trying to read the customer's mind. Here is the cake I decorated for her, and luckily she was thrilled with it. I was just thankful I got it right. Or right enough to please the customer. I had some issues with this cake at the time, so I while it was adequate, I honestly wasn't 100% happy with it. For the most part, it's a nice, level cake with no serious flaws, and the top tier is centered well. However, there are certainly a few things I'd like to change. I hate the ruffle. All wedding cakes and "french bouquets" that went out of that bakery got this ruffle ribbon thingy pushed under their base. It's just what they did. I personally think this cake would have looked much better without it. Plus, it made the bottom bead border nearly impossible to pipe evenly and straight, but you can't really tell that from the picture. How do you like all that luster dust? Talk about Super Pearl overload! This was back before I truly understood the concept of less is more. This cake is superfluously shiny. I have no idea what I was thinking when I piped those oversized beads around the base of the top tier. Especially since they're obviously wonky. I should've used the same tip I piped the other beads with, then there would be consistency. Speaking of the other beads, what the heck was I thinking putting them around the top of that bottom tier? It's supposed to look like a gift box with a lid, but instead I think it looks more like a square sofa cushion. I put way too many blossoms all over the cake, and I think they make the whole thing look too busy. Again with the less is more thing. Now, I remember at the time not being happy with the bow because it was actually really messy at top, but thanks to strategic camera positioning, you can't see it. Also, I think I should've broken up the purple periwinkle and grey silver with white bow loops. 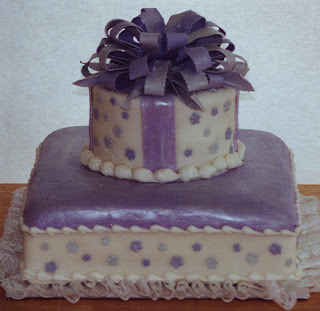 And finally, the front ribbon on the top tier is crooked. Just slightly, I know, and I didn't even notice it at the time, but has haunted me in this photo ever since. What a nice cake. It is perfect for my father day that is next weekend. I will try to do something like this, hope to be good.